Today I am sharing one of my recently favorite pieces in my closet….because really not much fits…. Being in my third trimester, being comfortable is everything! Behold the stylish body-con. Its a non-maternity dress that is perfect for maternity wear! I nabbed THIS DRESS up at Abercrombie awhile ago on major sale! Its really stretchy, midi in length, but is thick enough to hide the lumps…and well some of the bumps. I wanted to share THIS DRESS 4 different ways to transition it this fall! Grab your favorite fall flannel or button-up and tie it above the bump! Easy! A good striped tee …long-sleeve or short-sleeve is the perfect layering piece to give this dress a different look. What is easier than a Cardigan? Grab your coziest long cardi and you have a perfect fall outfit! Too Hot yet? Wrap your jacket or your flannel around your waist…or what you have left of one! This is actually my favorite because it hides your growing hips and gives you a waist that has disappeared over pregnancy! 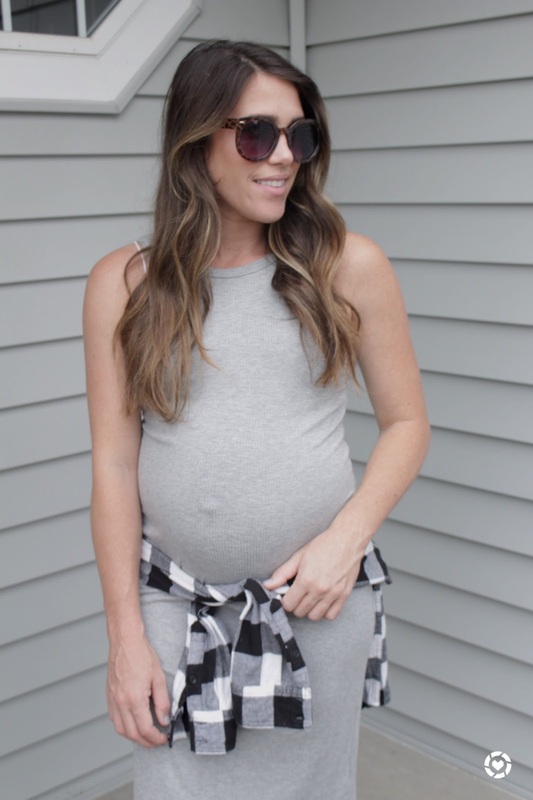 Let me know what you think of the body-con during pregnancy! I have linked everything below as well as within the post! Let me know below any other ways you would wear this in the comments below!! Thanks for reading! !